I’m very excited to share a project I’ve been working on for some time now. My first e-cookbook has been published. The Gluten-Free Diner is ready for you to get instantly. Now those of you who were signed up for my newsletter already knew it was out and had received a discount code. I appreciate all of you that have already purchased the book. Thank you. If you’re not signed up for the newsletter and want to be among the first to get the latest news, tips and recipes, sign up for it here. Now that I’m sharing The Gluten-Free Diner with the wider world, I am offering a special introductory discount that will expire in 3 days so don’t wait to get your copy. Be sure to read to the end of this note for the discount code. This cookbook not only has recipes, but a menu on how to put them all together for tons of great meals. Click Here to check out what’s on The Gluten-Free Diner Menu! Also included on almost every page is a little blue box where you can take notes on something you might change to your own taste, what you would serve that recipe with, mark it as your favorite to make again or anything else you want to remember. Almost every recipe has a photo of the dish. I don’t know about you, but I’m a very visual person. Show me the photo! As always, I love to get your pictures when you make these recipes. Please send them along, especially if you make the two recipes that don’t have photos so I can add them in the next edition. I would love for each person who reads this to purchase The Gluten-Free Diner and then pass this message along to others. This cookbook makes a great gift for those people in your life that always want to cook for you, but are not really sure what a gluten free meal would be. Maybe you are looking for a gift to give a teacher, co-worker, friend or neighbor. How about that Dad that likes to cook or other family members that insist on giving you that dry plain piece of chicken or fish when you visit. Of course these meals are great for those who do not even follow a special diet, but just love diner meals. I’ve tested these meals on company, and not one of them ate gluten and dairy free and not one of them even noticed it was missing. I’m also excited to announce our Affiliate Program. If you have your own blog and want to get paid every time someone follows the link you provide and purchases a cookbook, please check out the Affiliate Program. I’m offering a great commission, even on your own purchases. 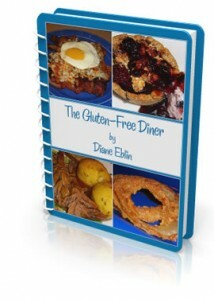 So if you are ready to get your own copy of The Gluten-Free Diner and get that $2 discount, go now to purchase and use the code save2gf. Remember this discount expires in 3 days! If you write about this cookbook or share it in a video book club, I would love to add your name and link to the list. Jenny- Hmmm, did you register for the newsletter after Jun 6th? That's when the notice went out. Sorry you missed that note but happy to hear you like the new code and cookbook. Wow! These recipes are making my mouth water. What a great cookbook! Thanks Diane!!! Stephanie- Thank you! I hope you will share the news with others and give some of these recipes a try. Aubree- Thank you so much.